We welcome new members so if you would like to join us, please complete the application form online	or open a PDF form you can print and post - see button below. . Please include brief details about yourself and your collecting interests together with a recent photograph if possible. It is always very useful to get new ideas so if there is anything specific you are looking for from our Journal, please let us know. Addresses are never released without prior consultation with members concerned. These depend on the cost of posting the Journal to you. If you want the Newsletter and Journal in hard copy, subscriptions are: UK £19, Europe £26, rest of the world £30. If you are prepared to read the Newsletter and Journal online or download/print it yourself, the subscription is £5 for members worldwide and you will be sent a password which is changed for each issue. Bank transfer. 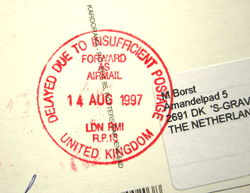 Please pay to ‘Postage Due Mail Study Group’ Sort code 20-19-95, account 30008826 and insert your name as reference. From outside the UK we suggest paying by Transferwise (or similar transfer service) which is cheaper than using a bank: see https://transferwise.com Our IBAN number is GB35 BARC 2019 9530 0088 26 and (if needed) our SWIFTBIC is BARCGB22. Don’t forget to send an email to secretary.pdmsg@gmail.com advising that you have made the payment. Alternatively you can pay online using the PayPal button below, which will allow you to pay either via a Paypal account or using a credit/debit card. If using this method we would appreciate an optional ‘donation’ of an additional £1. Subscriptions are for a calendar year: new members joining during the course of a year will receive all that year’s publications.